DID YOU SEE a fireball shooting across the Irish sky last night? If you spotted the fragment of a comet at around midnight, you’re urged to get in touch with Astronomy Ireland, who are trying to find the location where it may have landed. David Moore, Chairman of Astronomy Ireland, told TheJournal.ie that the organisation received a number of reports about the fireball overnight. He said that “these things tend to happen 50 – 100 miles above the ground” so it could have been seen in any part of the country. Last year we had three major fireball incidents and received 1000 written reports for each one. But for every one person that reports it, there are probably dozens who don’t report it. That’s why we’re appealing to people. Once Astronomy Ireland has announced where it thinks the fireball might have landed, it encourages people to look for fragments, which will look like burnt rocks. The fragments will have had their outside melted by the fiery re-entry process and are usually smooth unless split in half. People who email Astronomy Ireland about the fireball will be added to the mailing list for free – once it is determined if the comet fragment landed on Irish soil, they will be emailed with the possible location. 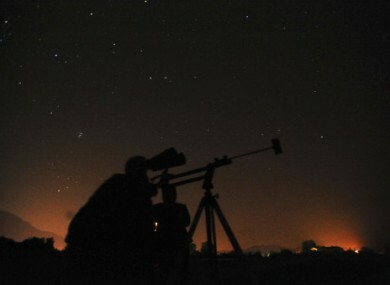 Astronomy Ireland hopes to receive enough reports this week to complete the analysis and announce results at its Star-B-Q, taking place this Saturday, August 27, in Roundwood, Co Wicklow. The event is open to all. We won’t conduct a search so people can trust us with their reports. We won’t tell anyone until we tell everyone. David noted that collectors have paid very large sums of money for Irish meteorites in the past, as they are such a rare occurrence. Meteorite material was discovered in Ireland in 1999 and 1969. Fragments of the 1999 Irish meteorite sold for $500 dollars per gram on one occasion. Astronomy Ireland estimate one fireball passes over Ireland every year, but due to weather conditions we will see just one every ten years. Depending on the size of such fragments, some fireballs may ‘explode’ in the atmosphere with the energy of an atomic bomb. The fireball is likely to be a piece of a comet or asteroid that passed near Earth’s orbit sometime in the past. As a general rule of thumb, the brighter a fireball is, the more likely it is to have survived the fall and landed on the earth, and last night’s fireball was reported to have been big and bright. Those with eyewitness reports and any CCTV footage of the event can contact Astronomy Ireland at www.astronomy.ie/fireball or sign up for the mailing list at www.astronomy.ie/friends. Email “Search on for comet fragments after fireball seen over Ireland”. Feedback on “Search on for comet fragments after fireball seen over Ireland”.